February is full of holidays with so many crafting opportunities for myself and M, which has led to a busy few weeks. I've signed up for a MOOC with FutureLearn on Richard III which is taking up what little free time I have in the evenings, plus I have a BSL course to make progress on, meaning I'm feeling a bit over commited at the moment. It is all good though, I just need more hours in the day! Knitting wise, I've been plodding along, making another cardigan for M. Sadly I've been thwarted by the yarn. I am one of those people who likes to match up stripes in self striping yarn. Knots in said yarn are frustrating, because it makes matching those stripes harder. The more knots, the more difficult it gets. I ditched the yarn I was using, frogged and started again after the seventh knot. The yarn in question is now destined for pompoms, or kids crafts, or dresses for teddies, or anything where I don't care if the stripes don't match. I restarted the cardigan immediately using a different self striping yarn and this time it is coming along nicely. I have only one piece to finish before making up, so hopefully it will be finished this side of summer! Most of my crafting efforts have been directed at things I can make with M.
For example, we made this ram for Chinese New Year (it being the Year of the Sheep, or Wood Sheep, or Ram or Goat). 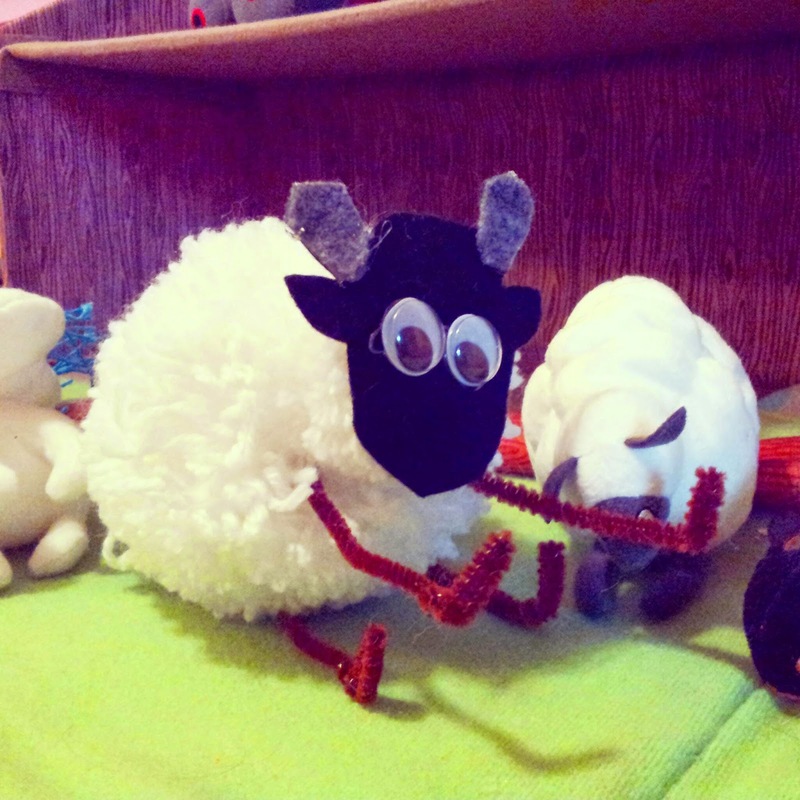 He is a rather cute ram, made from two pompoms glued together. A big pompom for the body, with a smaller one for the head. I pushed some pipe cleaners through the middle for the legs and stuck a felt face on the front. M did her share of wrapping the pompoms, a good fine-motor activity for little ones. This was her first attempt at making pompoms and M was worried when I cut the threads, asking me if I was _sure_ that was what we should do. I assured her that this was indeed what we needed to do, so M watched closely, but with a doubtful expression, as I snipped my way around the proto-pompom. I tied the pompom tightly before easing the template off, then presented the resulting oval ball to the delighted M for fluffing, which she did an expert job of. M drew the face for the sheep, which I used as a template for cutting out the felt shape you can see in the picture above. M was worried it looked too much like a cow, but I assured her the face was suitably sheep like and you can see the result for yourself. M also chose the eyes she felt were most appropriate in size. I warmed up the hot glue gun and went to work, the sheep taking shape quickly in my hands. Next time I do this, I want to look for extra strong sticky dots so the glueing can stay within M's remit and it might be nice to have more substantial pipe cleaners to hand, as my standard stock ones are a bit spindly. We were both very happy with the result and M ran off to add the ram to her flock of sheep in her toy farm.